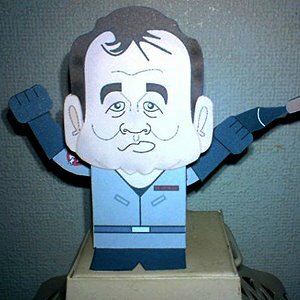 This paper toy is the Peter Venkman, based on the film The Real Ghostbusters. The papercraft is designed by Graham Wilson. Peter Venkman, Ph.D. is a fictional character from the Ghostbusters franchise. He is a parapsychologist and member of the Ghostbusters, appearing in the films Ghostbusters and Ghostbusters II and in the animated television series The Real Ghostbusters. In both the live action films, he was portrayed by Bill Murray, and was voiced in the animated series first by Lorenzo Music and then by Dave Coulier.